A cooling system transfers heat from one source or medium to another. There are volumes of literature that explain cooling systems available on the internet so there’s no reason to repeat it here. All cooling systems need treatment for scale, corrosion, and biological contamination, the damaging impurities that impact operation and efficiency of the HVAC or process equipment. Common applications for cooling systems are for HVAC (heating, ventilation, and air conditioning), or comfort cooling in office buildings, hospitals and schools; or for industrial manufacturing equipment and processes. A recurring theme is apparent here: scale and corrosion. The elements found naturally in water impact the water’s pH – a measure of acidity and alkalinity. Neutral pH is 7, a reading lower (0-7) indicates acidity, and a number reading higher (7-14) indicates alkalinity. If water were able to be kept at a perfect 7 neutral there would be no need for treatment of any kind. Managing the pH of the water and it's cumulative damage is a balancing act of major proportions – too acidic is corrosive; too alkaline or base is scaling. Which chemical mixture is going to work best, with the least amount of damage, for the longest period of time? Unfortunately for the customer, this is a very expensive proposition, with ongoing, escalating chemical costs; growing water and sewer costs from the vast amounts of water necessary to keep their equipment running; environmental costs and regulations associated with the toxic discharge water; hazards of handling and storage of these toxic water treatment chemicals. But the worst part of this balancing act is that the chemicals just mask the symptoms…the disease of scale, corrosion, and biological activity still exists. 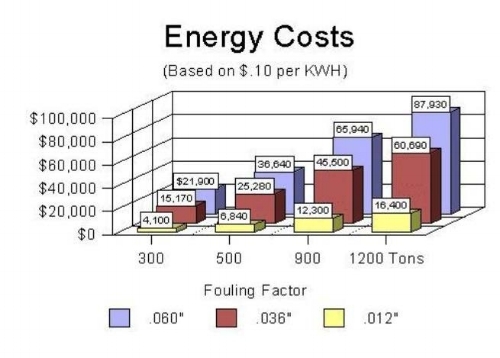 As you can see from the chart above, even the smallest amount of scale is costing you tremendous energy dollars. Scale fouling is an insulator inside the tubes of your heat transfer equipment and is the result of an inadequate water treatment program. Why continue paying for inconsistent disposable water treatment that also costs you so many energy dollars? Bon Aqua treatment cures the disease by offering a cleaner, safer, more effective way to balance the assaults heat exchange equipment faces daily—the photos below clearly illustrate that difference--chemical treatment on the left, Bon Aqua treatment on the right. Click here to see the diverse facilities that can truly benefit by utilizing this technology.